Electrical plugs and sockets present no hazard if used properly and are in good condition. 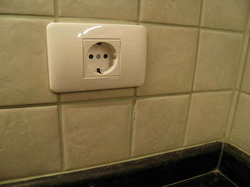 A lose wall socket or a partially broken electrical plug can expose you to electrocution danger. 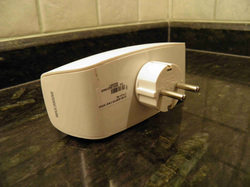 The socket needs to be fixed and the plug replaced before further use. 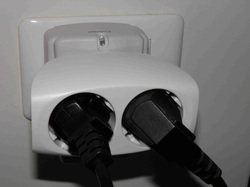 A plug that does not match the socket can cause faults or start a fire. 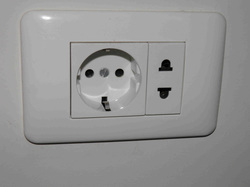 A Schuko outlet is round and includes earth connectors. It is very easy to distinguish (left) from American sockets (right) in the below picture to the right. Specific Shucko multipliers are available. This one provides 3 grounded Schukos. It has itself a Schuko plug that goes into the wall socket. The result is safe and elegant. The cables are parallel and the sockets remain vertical not to accumulate dust. 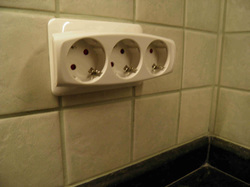 You can also multiply a Schuko into non grounded sockets for table lamps, phone chargers, etc. It is always a Schuko plug on the other side, without ground conductors in this case. Do not use these multipliers with non parallel and non vertical outlets. They are a source of fire!